You know some people just have that polished, finished look? They look effortlessly put together and stylish? Well, I have been trying hard to work out that wizardry, and I think I have sussed it. Its accessories. I look at magazine pictures I love, or Pinterest outfits Im drawn to, and it seems the helpful key is a carefully chosen accessory or two. Now, anyone that knows me would know that my handbag collection needs no work, I have a great range of choice there, (Lets not talk about it, Im not ready to go into therapy for that little addiction just yet), but I have recently re-discovered accessorising with jewellery and Im loving it. In my job as a skin therapist, I couldn’t really wear jewellery, but since retiring from salon ownership, I am free to accessorise to my hearts content and Iv fallen back head over heels in love with wearing it. 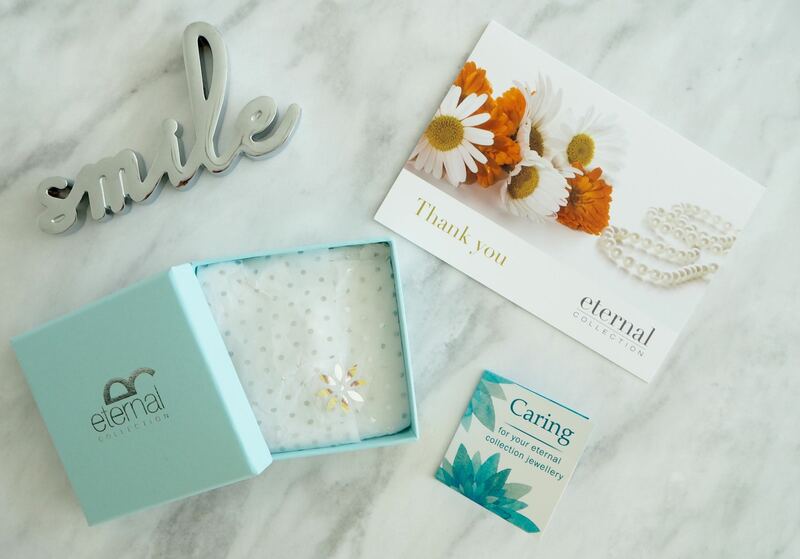 I was recently contacted by the lovely people at Eternal Collection, (clickable link) to see if I would like to choose something from their range to wear and review. I had discovered the brand via another blogger a while back, (my gorgeous galpal Steph, see her blog here) and had stalked their social media timelines ever since, procrastinating over my online shopping bag, so of course, I jumped at the chance! 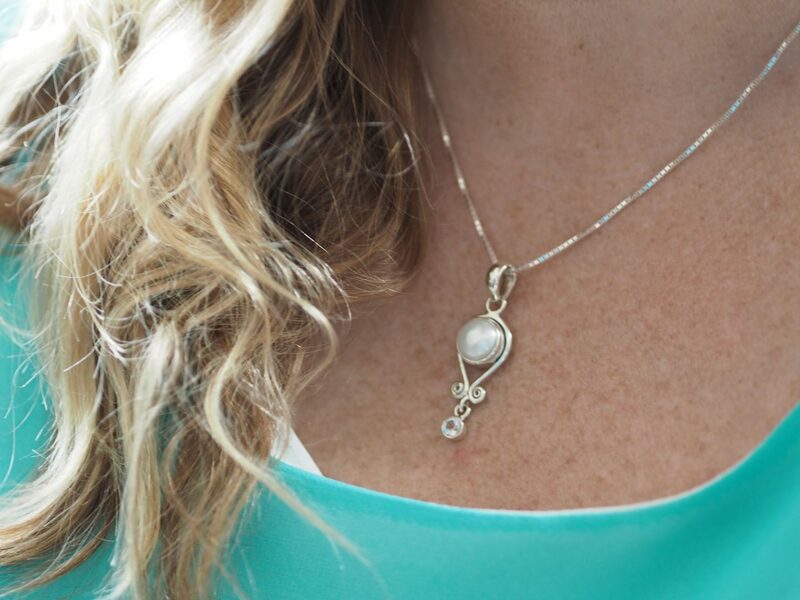 If you are not aware of this fabulous brand, they are an online costume and silver jewellery company, specialising in stylish, affordable pieces. (They also have a huge range of clip on earrings). I love the fact that they are a family run business, (run by a husband and wife), and have been styling us all with their beautiful, affordable items since 2007! 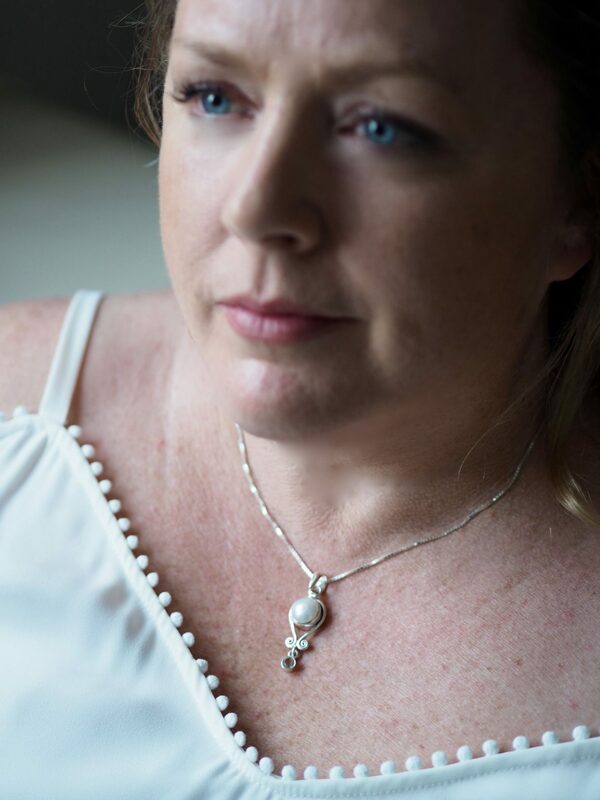 I also love that most of the jewellery is hand made by Paul, (husband) and his team, and Pauline (wife) hand picks items from around the world, (you can see their love of Italy reflected in their pretty Murano glass collection) so there is that personal, crafted element. So you would think that selecting an item would be fun, and easy, but it took me 3 days to make my decision as there were so many items that caught my eye. The Tree Of Life Pendant really tempted me, and its meaning really spoke to my meditation/mindfulness loving soul. I have also been obsessed with their “Bee pendant” for ages (anyone that has read my blog for a while would have noticed my love of bee’s, especially bee’s on pretty flowers). However, in the end, I decided to go with something neutral as I thought I would be able to wear it more. My item arrived within 2 days, and came so beautifully presented in a gift box and tissue paper. I loved how it was secured within the box too, great to see they care about how their jewellery arrives to their customers. I like and appreciate that care taken. The fact it comes so carefully presented also makes it a great buy for gifts I think. My eventual choice was this gorgeous pendant**. Its from their Birthstone Pendant Collection, and as Im an April gal, my birthstone is Diamond (my husband is delighted with this fact). 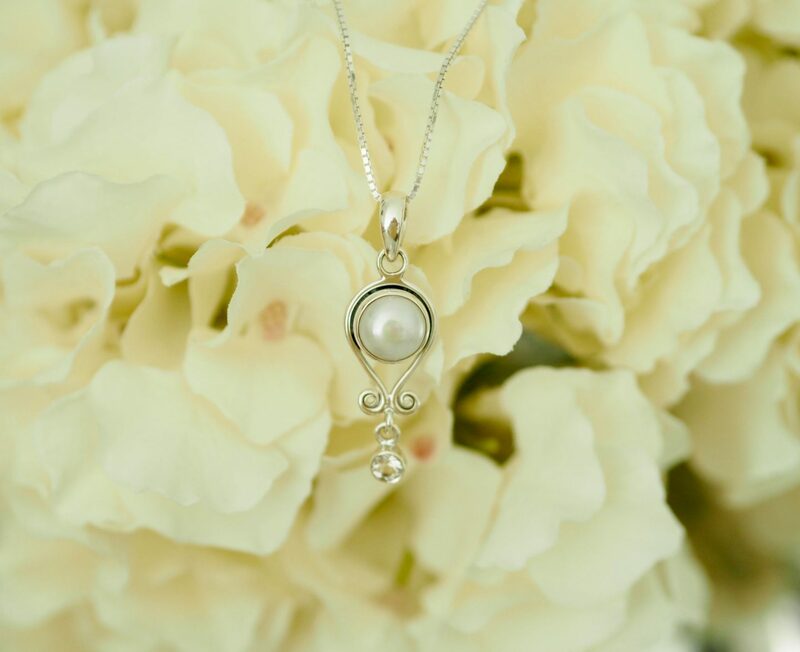 This gorgeous, fab quality sterling silver pendant is handcrafted and set with a faceted, quartz crystal and freshwater pearl. With a price tag of just £45, its so reasonable! 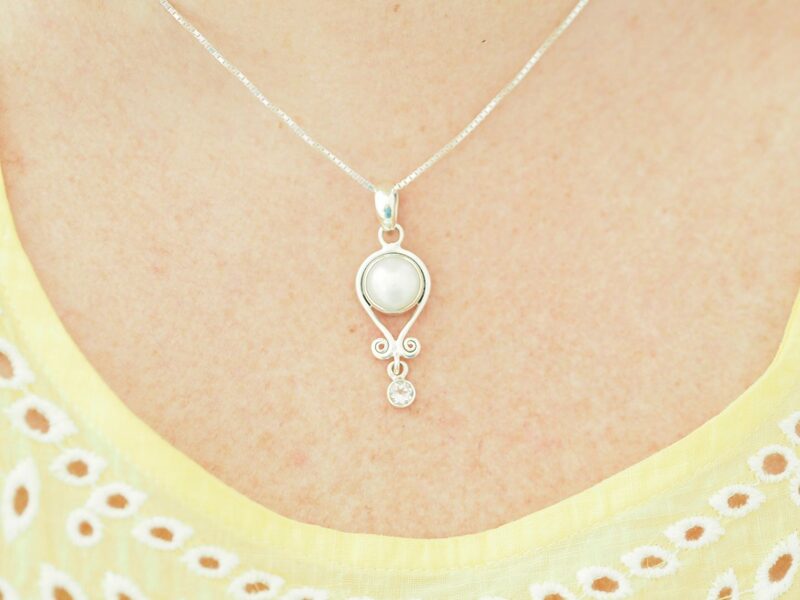 I adore it worn with a crisp, white open neck shirt and jeans, as well as my favourite yellow and white summery blouse. I think it would look amazing with an all black outfit too do you? If you haven’t discovered Eternal Collection yet, I would urge you to go and have a look at their site, but be warned, you will get jewellery-hungry-want-it-all eyes! The good news here is that there is currently a Summer sale in full swing throughout June, so its a great time to get those hungry eyes! I have my eye on the boho inspired Prosperity Turquoise necklace, how amazing would that look with a white, floaty summer dress! I hope you like my choice. Let me know if something catches your eye! ** Indicates that the item was kindly gifted to me by Eternal Collection. My review given is of course my honest findings and opinion. "Five Favourite Things – May"
"Faking it – Beautiful Blooms for your home"
Such a gorgeous necklace – love your birthstone too! Great choice Kerry! Looks stunning on you. Thanks Steph. I love it!